Bonnye Matthews, prolific Alaskan author, writes prehistoric fiction. According to Grace Cavalieri, she is America’s pre-eminent author of prehistoric fiction. According to George F. Steiner, Quaternary Geology and Pleistocene Cognitive Archaeology expert, “Her stories are fascinating and the science behind them is cutting edge.” Alaska appears only in the novel series in Tuksook’s Story, 35,000 BC. The novel series focus is the peopling of the Americas and the novella series looks at very old individual archaeological sites. That sense of satisfaction will last about 20 minutes. Courage, 30,000 BC won first place for YA Fiction at the National Federation of Press Women’s annual communication competition. The presentation will be made in September at the National Conference. This is so exciting! When I got to “setting goals,” I read “selling goats.” I did a double take to discover my error. It made me laugh a lot. For a moment, I mused over selling goats. Would that be profitable? I wondered. Ah ha, I could make a list of resolutions of my goats for the 2018 New Year! Way too much fatigue. I sell books. I can do without a yard full of goats. For that night, time to hang it up! From the images in Wikimedia I mused over tonight to add to this post, selling goats looks pretty profitable! Nah, not for me. I’d fall in love with each goat and be overrun with them. Does anyone have as much fun as I do being an author? The bags and tees arrived. Camels Can’t Carve? It’s all about the 250,000-year-old mammoth pelvis bone, where a green-carving of a gomphothere (4-tusked elephant) and large cat were found in Mexico. Camels and other animals were there, but they Can’t Carve! It must have been a human who carved the bone! People in the Americas 250,000 years ago? Why not? Bags are great for transport of things for book signings and other activities. I had them made at Kosmo Screen Printing in Colorado. My tees are my uniform for events. I also wear them when I go out, because people will ask what they mean. Kosmo Screen Printing does great work! I’ve seen several articles recently on the potential for people to profit on sales of promotional materials, bypassing the Publisher and Author. These may come from promotional materials from big publishers and from various giveaways. The “buy box” program on Amazon has set off some of these articles. People who sell well at lower prices can get a “buy box” and thus become the first source of a buyer’s selection on Amazon. I do giveaways and think it’s a good promotional practice when launching a book. I cannot see a giveaway of ten books as making much of a “buy box” opportunity. Just to be on the safe side, I made a change in my giveaway practice with my latest giveaway. I simply put on the title page inside, “to name of giveaway recipient” and then sign the page. Normally I send unsigned books to giveaway recipients. I assume that giveaway recipients want to read the books not use them for sales. By putting their name on the book, it personalizes the books and makes them less sale-able, for those books cannot be sold as new. Audio book for Freedom, 250,000 BC is just out on Audible, Amazon, and iTunes. I’m doing a GIVEAWAY of codes to receive a free copy of the audible book from Audible. I hope to build ratings and reviews on Audible and/or Amazon for the book and the reader. Gotta admit this is great fun! It’s every bit as exciting for me as holding a new paperback! Use the form on this site to email me, if you’re interested in the code for the free book. I’ll email you the code and process. First come, first served. The codes are limited. To hear a sample follow this URL https://www.amazon.com/Freedom-250-000-BC-Popocat%C3%A9petl/dp/B071LP1SW8/ref=sr_1_1_twi_audd_3?ie=UTF8&qid=1496182196&sr=8-1&keywords=bonnye+matthews There will be an arrow that plays a sample on the left under the image. 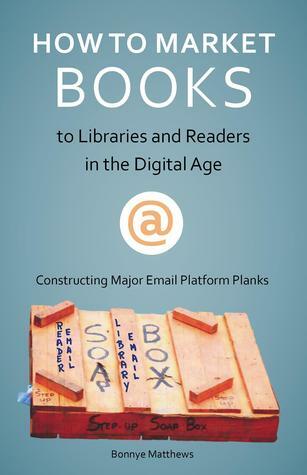 Starting May 11 until May 31, How to Market Books to Libraries and Readers in the Digital Age: Constructing Major Email Platform Planks will be on giveaway. Now’s your opportunity to get the book mailed to you from the author at no cost. Ten books have been set aside for this giveaway. Use the Goodreads link and take a look.